I love combining techniques in new and interesting ways. A lot of the time it won't work but occasionally you can create something amazing. Last night I did a rainbow gradient nail. I started by painting my nail white with Essie Blanc so I could make the colors pop. I used a make up sponge with layered colors of nail polish to make a rainbow I could sponge onto the nail in a gradient. After the rainbow design was finished I started on a water marble. Water marbling is the technique of taking nail polish and dropping it on the surface of a bowl of water. The nail polish will spread out over the surface in a circular pattern. You can add multiple colors to the bowl and then swirl them to give liquid patterns. The nail is then dipped into the pattern and when removed there is a gorgeous marbled pattern. 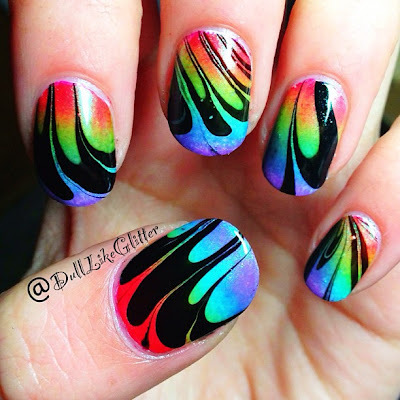 To display the rainbow through the water marble I used Julep Marissa which is a sheer shimmer color meant to go over other shades of polish, contrasted with China Glaze Liquid Leather.